Capturing and using the power of the sun is one of the most promising ways we have to supply the world with clean power. 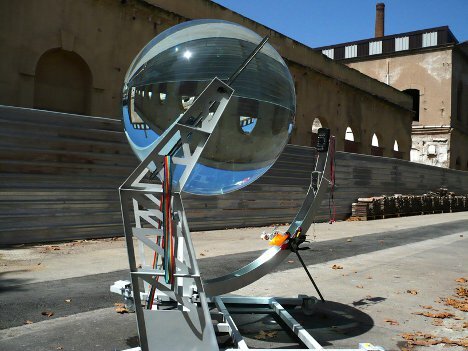 This spherical solar collector is able to concentrate sunlight up to 10,000 times. But the really fantastic thing about this system is that it can also create power from moonlight, something that other solar power systems have not been able to promise. The ß.torics system from designers Rawlemon is fully rotational and able to be integrated into building walls. 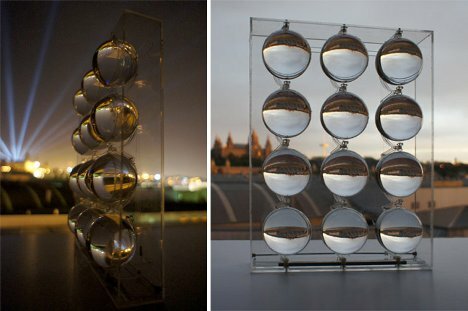 Because the spheres are made of glass, they can function as windows as well as solar collectors. Unlike other solar power collection systems, this one is truly beautiful. The high-efficiency system could be integrated into any number of urban applications, turning buildings into works of art capable of producing their own energy. The company behind the system claims that it is 35% more efficient than other solar options, making it an outstanding future option for green energy production. No word yet on how much the system will cost, however. See more in Energy & Power or under Science. October, 2012.